There is still a lot of snow in the mountain in the Northwest but I am already thinking ahead to spring. Gretel and I plan to hike a lot this summer in preparation for our 10-day backpacking trip. I don’t like to hike the same trails all of the time so I’ve been looking around Oregon for some fun options. I definitely added these trails to our bucket list and I thought I would share in case you wanted to add them to yours. 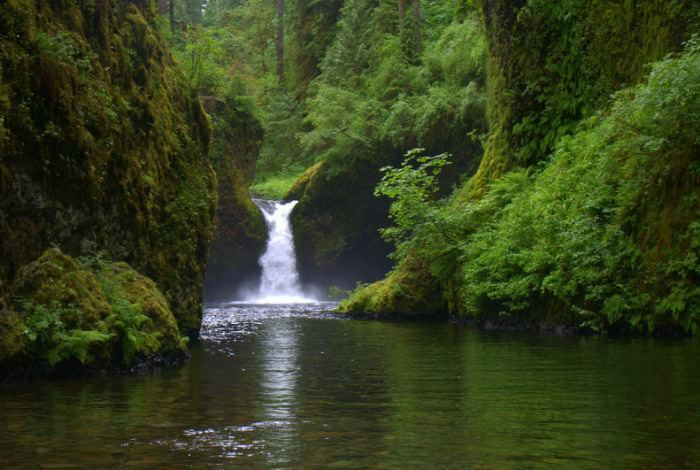 Punchbowl Falls is beautiful – water spills 30 feet into a blue-green pool set in a large grotto. The hike to the falls is approximately 4 miles round trip. Just because the trail is relatively short, and has a gentle grade, doesn’t mean it’s easy though. First, the trail is touted as one of the most popular hikes in the Columbia Gorge which means it is very, very crowded. To avoid a lot of people, it’s probably best to visit this trail in the off-season when the weather is a little cooler and/or be willing to get up really early and start the trail just as it’s getting light. You’ll also need a strong stomach for heights or precarious situations because sections of the trail are narrow and very exposed (steep drop off on one side). It’s highly recommended that your dog be a calm hiker as not to cause any distractions or mishaps on these treacherous sections of trail. And your dog should ALWAYS be on leash when hiking this trail. Not to be a downer but, according to the Forest Service, several off-leash dogs die here every year. You can read more about this hike from Muddy Camper. OK. This one is so amazing I have no words. Chester, Gretel, Hubby and I hiked very close to Broken Top Mountain and this lake during our first trip to Bend, Oregon. The views of Broken Top were amazing. We had no idea that this even more spectacular secret lake was about 4 miles from where we stopped. The hike from the Todd Lake trailhead is approximately 14 miles round trip. That’s a very long day hike for Gretel and I. 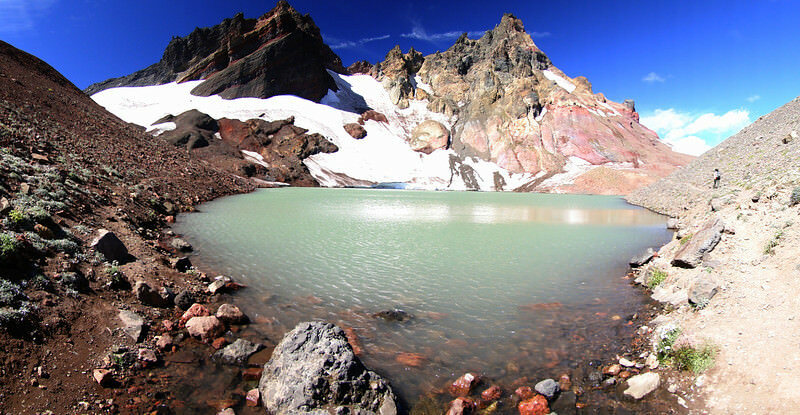 Also, Broken Top is located in high-desert country so it would be very hot in the summer. I think Gretel and I would have to save this one for later in the hiking season when we are in better shape and hike early in the day to beat the heat. Apparently you “can” drive to a trailhead that’s closer to Broken Top’s crater on road 370. However, the road is not maintained. Hiking guru William L. Sullivan called it the worst road in Oregon. According to Sullivan, you need a tough, high-clearance vehicle and more than a half hour to drive this 4.8 mile road. It looks like the trail to the lake is only 4.5 miles round trip from that trailhead. Since 5 miles can easily be done in a day, and I own a Toyota 4 Runner, we just might attempt this “miserable” road. You can read more about this hike in the Statesman Journal. If you’re looking for something more tame, this is the trail for you. You can see both falls via an easy, 2.6 mile “Waterfall trail” that connects to the McKenzie River Trail. 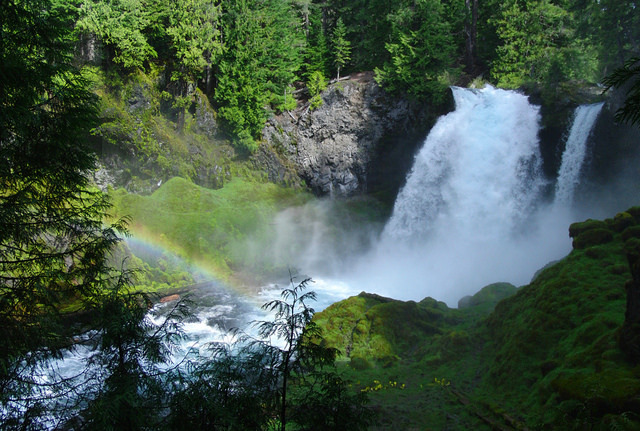 “The hike starts at 100-foot-tall Sahalie Falls, a raging cataract that pounds the river into rainbowed mist. Then the loop descends past 70-foot Koosah Falls and returns on the river’s far shore through forests of 6-foot-thick Douglas fir and droopy-limbed red cedar.” Source. I rode the McKenzie River trail on my mountain bike with Hubby over 5 years ago. It’s a beautiful, woody and mossy trail that follows the McKenzie River for 26 miles (one way). In 2008, Bike Magazine picked it as the best mountain biking trail in the U.S. and TheClyb.com named it among the “Top 5 Running Trails in the US”. Gretel and I would probably continue on the trail past the falls and make this a long day hike. Have you hiked in Oregon? Any other not-to-be-missed trails we should add to our bucket list? Drift creek falls is one of my favorite hikes, and bonus, it is close enough to the coast that you can hit the beach and hike the trail on the same day. Looks awesome. I’ll definitely add it to our list. Thanks! Will do…. and you guys can make 14 miles if Gretel and I can 🙂 14 miles in one day IS really pushing it though. Those all look gorgeous. I hope you get the chance to hike them. If you are near Bend again , on the Mackenzie River / Hwy 26, Proxy Falls is an excellent hike. It is short — a good place to stretch your legs between Bend and Eugene — and has two great waterfalls. I also like Mirror Lake and Frog Lake trails (near Mt. Hood). Ramona Falls is a must see, but the bridge is out so you would have to do a creek crossing. Thanks for the tips. I feel like we have been Mirror Lake but maybe not. I haven’t done any hiking in Oregon with my dogs, but I think I should add these hikes to my to-do list. Beautiful! Thank you for introducing us to some of the most beautiful trails Oregon has to offer. Wow! So beautiful! We’ve never been to Oregon and I’ve never knew there were so many beautiful places like this in Oregon! <3 What an inspiration for traveling! 🙂 Thank you for sharing! Me neither until a few years ago. I’ve always lived in Beautiful Western Washington and Oregon has always been a not-California-or-Washington no mans land in my mind. I’ve been to a few places I really liked over the last few years though. I look forward to exploring more of Oregon. If only we had money and Mom didn’t have to deal with that job thing we would road trip around and explore so many places. The northwest is so beautiful!